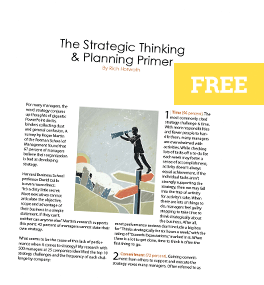 The two terms “strategy” and “tactics” are misused, confused and abused in many different ways. The difference between strategy and tactics is often described as “strategy is long-term and tactics are short-term.” While the two terms may adopt these characteristics at certain times, this is an inaccurate and incomplete way of explaining their meanings. The “long-term and short-term” descriptors for strategy and tactics may or may not apply. A strategy that successfully helps you achieve your goal in two months might be short-term compared to tactics you’ll use for two years in maintaining competitive advantage. Using time as the criterion for distinguishing between strategy and tactics simply doesn’t make sense. Since we can’t see or physically reach out and touch strategy, it’s often skipped in favor of going straight to tactics. Many of the business plans I review list goals, objectives and then tactics. If you don’t set strategy before tactics, then you have no way of intelligently changing course when you’re not meeting your objectives. At that point it becomes a game of “tactical roulette,” where you continually chamber a new tactic and pull the trigger in hopes that something hits the target. Sooner or later, you’re looking at a dead business. As my great, great, great, great, great grandfather Rich Tzu once said: “Think strategically, act tactically and wash your hands before you eat.” He was always a stickler for good hygiene.